10... 9... 8... 7... 6... 5... 4... 3... 2... 1... Happy New Year! Well, almost. It's time to make those New Year plans. 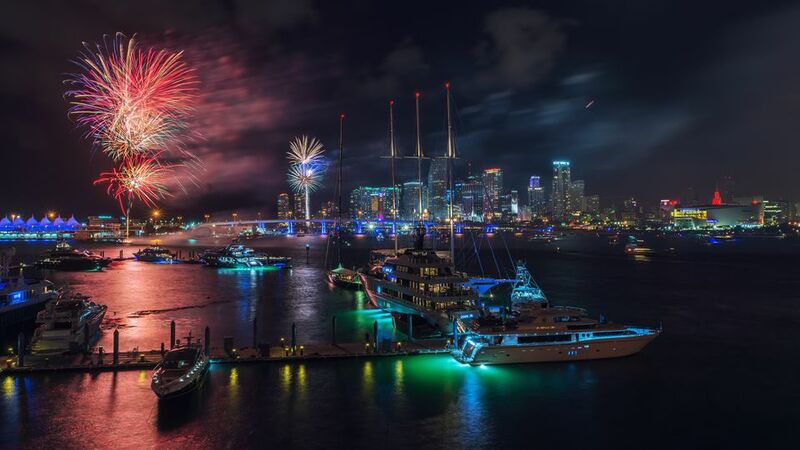 If you'll be in Florida to ring in 2016, you'll want to be at one of these top celebrations. Jacksonville Landing will ring in the New Year with live entertainment and the City of Jacksonville's fireworks at 12:00 midnight. Admission is FREE, but you must be at least 21 years old, present military identification or a TaxSlayer Bowl Patch. Pitbull’s New Year’s Eve Revolution 2015 at Miami's Bayfront Park will perhaps be the biggest New Year's Eve celebration in Florida as tens of thousands are expected to dance into the night. The party will include a countdown to midnight as "The Big Orange" ascends to the top of the adjacent InterContinental Miami hotel. The event will be broadcast live by Fox television. The major Orlando theme parks—Walt Disney World, SeaWorld Orlando and Universal Studios Orlando—have big plans for New Year's Eve. You can eat, dance 'til you drop and see the best fireworks displays ever. Universal Orlando Resort will present the Rock in the New Year with non-stop entertainment at CityWalk. CityWalk, Universal Orlando's 30-acre entertainment complex will host live music on the plaza stage, an all-you-can-eat gourmet buffet — featuring filet mignon, jumbo shrimp, decadent desserts, and more—fireworks and champagne toast at midnight. Bring in 2016 with the annual New Year's Even Celebration First Night St. Petersburg and enjoy a fireworks frenzy! This bay area celebration features entertainment, fantastic fireworks, food, and games at more than 25 venues in Midtown and Downtown from 4:00 p.m. until midnight. The alcohol-free event for children and adults is FREE for those age 5 and under. When purchased in advance online, adult admission is $10 and $5 for ages 6 to 12 (December 31, tickets will be $15 for adults and $10 for children). Busch Gardens is celebrating the New Year with its wildest celebration ever. Fabulous fireworks at midnight on December 31. You can give 2016 the ultimate "wild" welcome with dive in the dark aboard Falcon's Fury. This event is included with daily park admission or a Passport membership. Make a splash on the social scene this New Year's Eve at The Florida Aquarium's Aqua-Eve from 9:00 p.m. until 1:00 a.m. where you will see and be seen as you enjoy live entertainment, great food, complimentary beer, wine and food, underwater wonders, the best fireworks display in Tampa and a champagne toast at midnight. Lowry Park Zoo will host a countdown to noon during their Noon Year's Evecelebration from 9:30 a.m. to 12:30 p.m. December 31. Families can ring in the New Year with games, arts & crafts, live entertainment, noisemakers, hats and a juice toast at 12 o'clock... noon. If you want to see the prettiest sunsets on earth and fireworks too... be in the Florida Keys on New Year's Eve. Islamorada fireworks are displayed over the Atlantic Ocean and can be seen from shore. Southernmost City (Key West) celebrates New Year's Eve with a conch shell drop at Sloppy Joe's Bar, "wench" drop at Schooner Wharf Bar, and red high heel drop with drag queen Sushi at Bourbon Street Pub/New Orleans House. Of course, Key West's Sunset Celebration at Mallory Square is an everyday affair that combines the natural beauty of Florida's sunsets with a carnival-type celebration. Whatever your plans for New Year's Eve, please drive responsibly and stay safe... and, make a visit to Florida one of your New Year's resolutions! 10 Ways to Celebrate New Year's Eve in Washington, D.C.